This comic is factual, but it requires a couple clarifications: Wallace Stevens was an executive at an insurance company, not your average insurance salesman. And there's no evidence that Emily Dickinson liked cats, but her sister Lavinia was cat-obsessed. So Emily must have been forced to cat-sit occasionally. You can order a poster here. you should really put a pinterest button! love your comics btw! despite the quibbles, this is brilliant. It is absolutely brilliant. Love it. Just wondering why 10/12 poets are male? bukowski really worked at the mail company. love it. dr. ford is right, you should do one with female poets, too. "So Emily must have been forced to cat-sit occasionally" seems like it might have been plagiarized from a freshman comp paper (but not a good one). @ Anonymous - so most Universities in the UK are *not* "public?" - or what...! Doooh..
You can't use a university library if you're Joe Boggs, a member of the public. You can apply for special admittance privileges but typically if they accept you're not allowed in past 5pm. Uni libraries are for uni students. "In autumn 1943 Larkin was appointed librarian of the public library in Wellington, Shropshire." Straight from Wikipedia, so you know it's legit. This reminded me of the Gashlycrumb Tinies. Perhaps lesser-loved poets have been assaulted by bears in another panel. Why not Nabakov, lepidopterologist? He studied butterflies fairly seriously for most of his life, in addition to writing novels. Well, Nabokov wasn't wasn't a lepidopterologist as a day job. 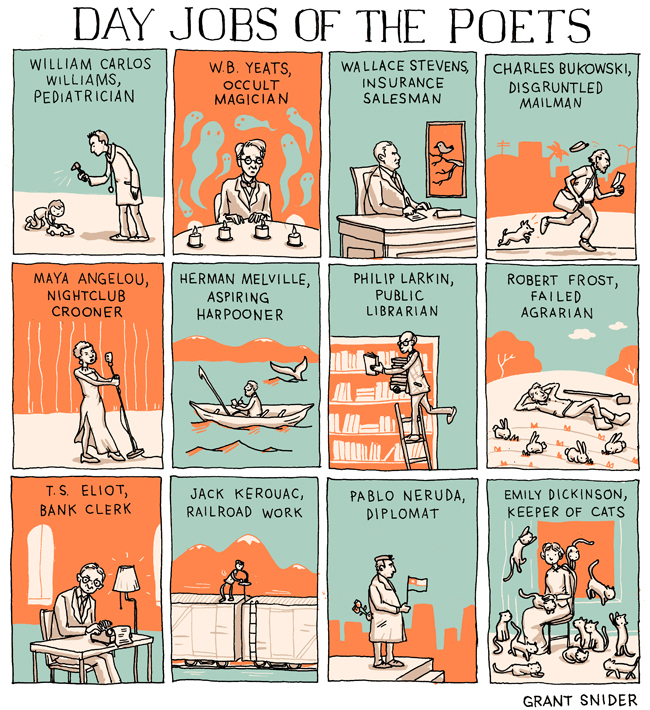 But then, I suppose Herman Melville wasn't an aspiring harpooner as a day job, either. Sylvia Plath was a psychiatric receptionist, and Anne Sexton was (briefly) an advertising model. You are clearly brilliant, Grant! I love your illustration style, your humor, your insight, and your color choices. Why are you studying orthodontics instead of illustration/design? William Yeats was sort of bats. Melville wrote of thieves and crooks. One not taken by Frost we're told. Larkin dealt in "ifs" and "maybes." Melville waorked at the Customs house.